Pierre-Emerick Aubameyang scored twice as Arsenal opened their Europa League campaign with a 4-2 victory over Vorskla at a half empty Emirates on Thursday. The Gabon international made it 1-0 with a neat finish before Danny Welbeck headed home the second shortly after half time. Auba made it 3-0 with a superb effort from the edge of the area and Mesut Ozil came off the bench to make it 4-0 before Vorskla grabbed two late stunners to take the shine off the score-line. Leno 6/10 | Very little to do in terms of shot stopping other than pick the ball out the net twice. Couldn’t do much for either goal as they were lovely strikes. Far more comfortable with the ball at his feet than Petr Cech. Bigger tests to come. Lichtsteiner 6/10 | Solid enough but doesn’t offer the same attacking threat as Hector Bellerin. His positioning is better, as you’d expect as he’s a hugely experienced full-back, but let himself down with a poor attempted challenge which led to their goal. Holding 6.5/10 | Quietly went about his business and didn’t put a foot wrong in defence. Hopefully he can push Mustafi for the starting spot. Sokratis 7.5/10 | Another impressive outing from the Greek centre-back. Showed good positioning and excellent pace at times. Growing in to his role at the club with another commanding display. Monreal 6.5/10 | Far more involved going forward than Lichtsteiner. Played his part in the second goal and wasn’t really tested defensively. Torreira 7/10 | Was in the wars as he picked up a foot injury in the first half but soldiered on to put in a busy display. Always wants the ball and dictates the tempo from deep in midfield. Maybe a few too many backwards passes at times but never wastes the ball. Off in the second half, which could have been because of his foot from the first half or Emery may be saving him for Everton. Elneny 6/10 | Average from Elneny. Doesn’t do much wrong, but doesn’t do enough to warrant a regular start either. Just a bit meh. Mkhitaryan 7.5/10 | Impressive night in the central attacking midfield role. Had a hand in three goals, grabbing two assists, and was always a threat. Much more influential playing in the middle rather than on the wing. Iwobi 8/10 | A very impressive display. Always keen to make things happen when on the ball and set-up the first goal with a lovely cross. Passing was a little sloppy at times but made up for it with an excellent all-round display. Welbeck 7/10 | Got another goal with a neat header and worked hard in attack. Wasn’t as involved in the build-up play as some of his team mates but never hides. Aubameyang 8/10 | Two wonderful finishes will do his confidence the power of good. The second in particular was superb. Also hit the post and was a constant threat to the visitors defence. Ozil 7/10 | Surprised he came off the bench but another goal for Mesut with a simple far post finish. 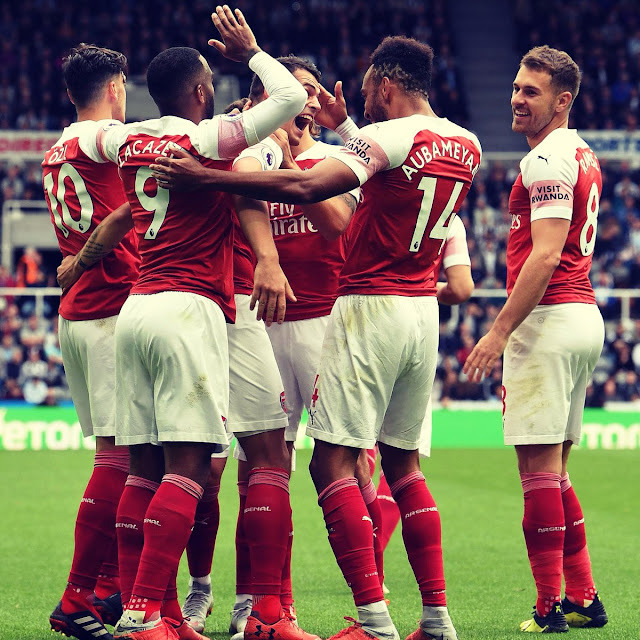 Guendouzi 6.5/10 | Was having another impressive outing but switched off for their second goal. Smith-Rowe 6.5/10 | Impressive late 20-minute cameo from the youngster. Such an exciting talent.